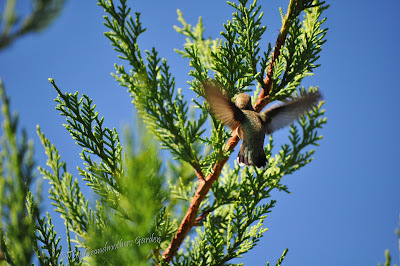 Last summer there wasn't much action going on at my Hummingbird Feeders... but near my grove of Leyland Cypress trees... there was a party going on! 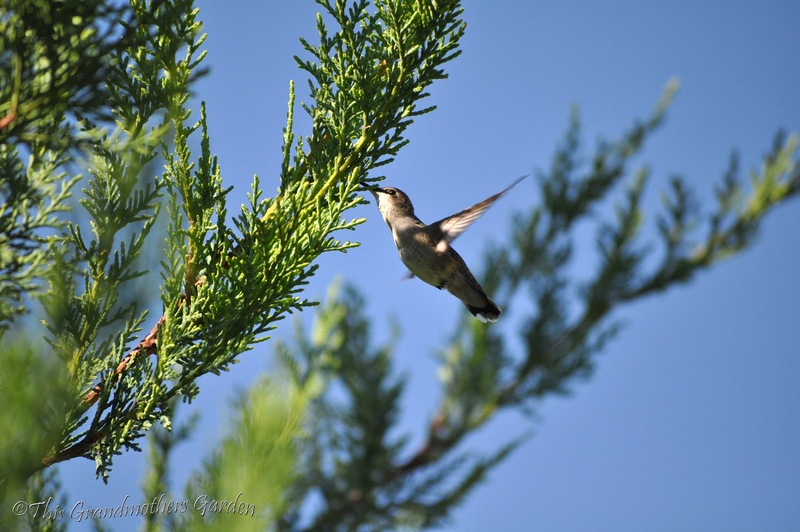 Who knew that Hummingbirds love Leyland Cypress trees? It was such a fun discovery. 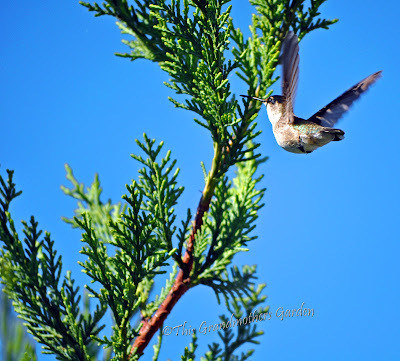 These photo's were all taken on a magical Summers day in August. What a delight it was to watch these amazing little birds. 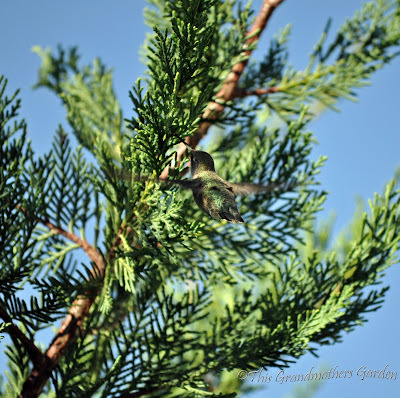 I must admit, Leyland Cypress was a favorite evergreen of ours long before I discovered the hummingbird's attraction to them. We first fell in love with these beautiful trees when we lived in Oregon. We had just moved to a new state into a new home, that had no landscaping. We knew nothing about plants in this region, so I spent a lot of time visiting nurseries and gardens before we designed the master plan for our landscape. I was on the lookout for new ideas for this new part of the world we had moved to. I soon discovered that just about anything will grow in Oregon so I had lots to choose from. (Oregon surely must be the nursery capitol of the USA, next time you buy a tree or plant, check the tag, most likely it came from Oregon.) 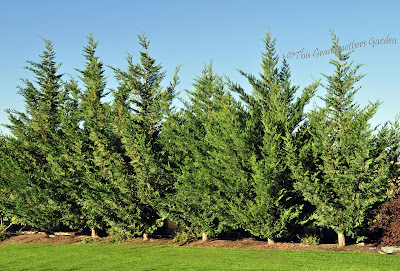 We actually saw a row of Leyland Cypress in our neighbor's yard and decided in unison, "We've got to have those trees!" Yes they are that beautiful! So we planted several and absolutely adored them. When we came back to Utah, we wanted to include many of the features we loved about out Oregon gardens. Leyland Cypress was at the top of our list. We searched everywhere for them. Couldn't find them in nurseries or in landscapes. I finally inquired about them and I was told they wouldn't grow in my zone 5 gardens, especially in our area where the Highland winds can sometimes be intense. That wasn't the answer we wanted to hear. 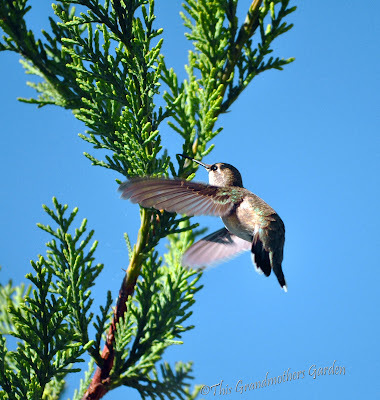 I longed for my Oregon gardens, it was hard to leave them behind. So I kept searching for Leyland Cypress in spite of the advice we had been given. And then I found them... at Home Depot. Doesn't Home Depot sell just about everything for your gardens regardless of what zone you live in? Well this time it was a blessing. I purchased six of them without blinking. Each tree was about five feet tall. I was willing to take a gamble that they would grow in my new gardens. My Honeyman dug the holes in our hard clay soil and planted them on the property line 5 ft. apart. We wanted them to provide a screen and sound barrier from the neighbor's play area. 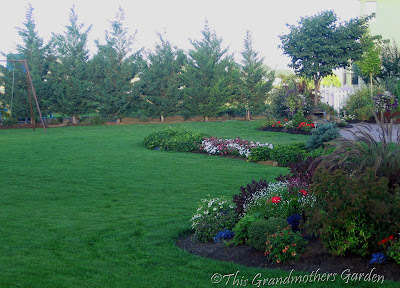 We installed drip heads at the base of each tree so they would get get regular watering during our hot Summer months. Then we crossed our fingers and waited for them to grow. That was almost eight years ago. Today they are thriving and stand nearly 30 ft. tall. 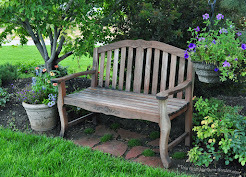 They are a favorite element of our gardens. We're often stopped by walkers on the paths that run throughout our neighborhood to ask what kind of tree they are. I love to tell them our story. We took a chance and it has paid off. The Leyland Cypress is a hybrid between the Alaskan Cypress and the Monterey Cypress that occurred in Wales in 1888. It grows rather quickly (about 2 ft. per year) and has a dense structure, making it ideal for use in privacy screens and windbreaks. It has feathery, soft pointed needles arranged in flat sprays on long thin branches. And as with most evergreens, its needles release a pleasant fragrance when broken. 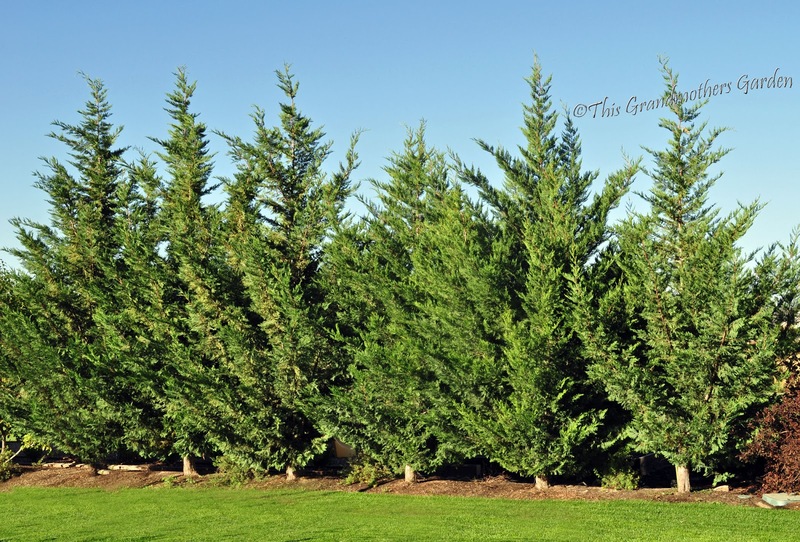 Leyland Cypress trees thrive in full sun to light shade and tolerate most soil types. 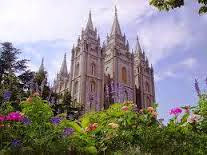 They will grow to a height of 60-75 feet tall with a 10 foot spread. as the sun softly filters through them. And they are absolutely stunning in Winter. Besides, the Hummingbirds adore then as much as we do! Can't wait for the party next Summer! 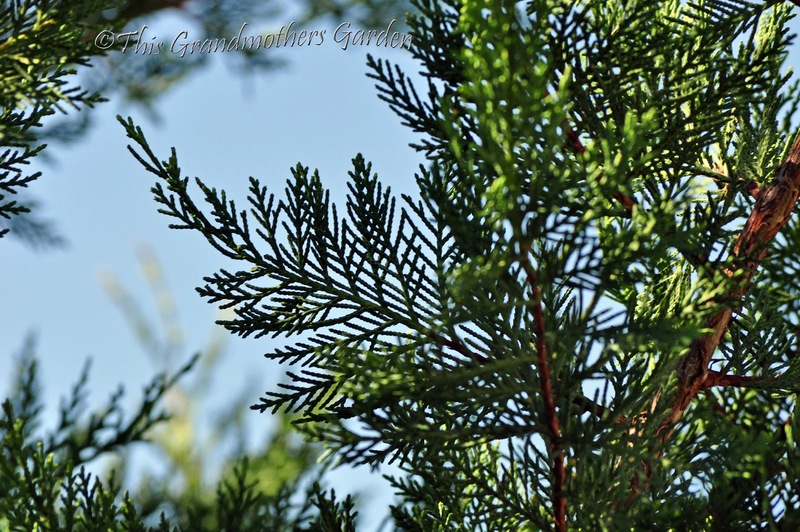 Another post or two coming soon about Evergreens in our gardens. Stay tuned! I have never seen hummers at evergreens but those pics are amazing as are those trees...I will have to look into them if I have space to plant trees....I marvel at how you can get such great shots of these fast moving birds...and I love how you were not to be thwarted in your garden until you had those trees...you know when something is just right for your garden...BRAVO! What an interesting posting. 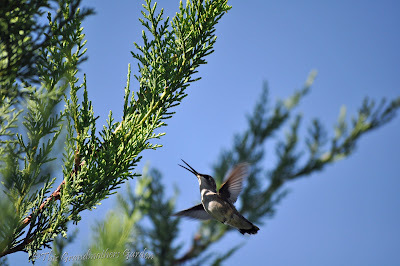 I never knew Hummingbirds liked the Cyprus trees or ate bugs. What fabulous shots of them! 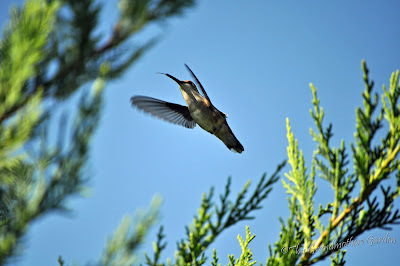 It must be amazing to watch them buzzing around, such gorgeous birds. You do have green thumbs! those trees are so pretty with or without snow, and hummingbirds are an extra bonus. 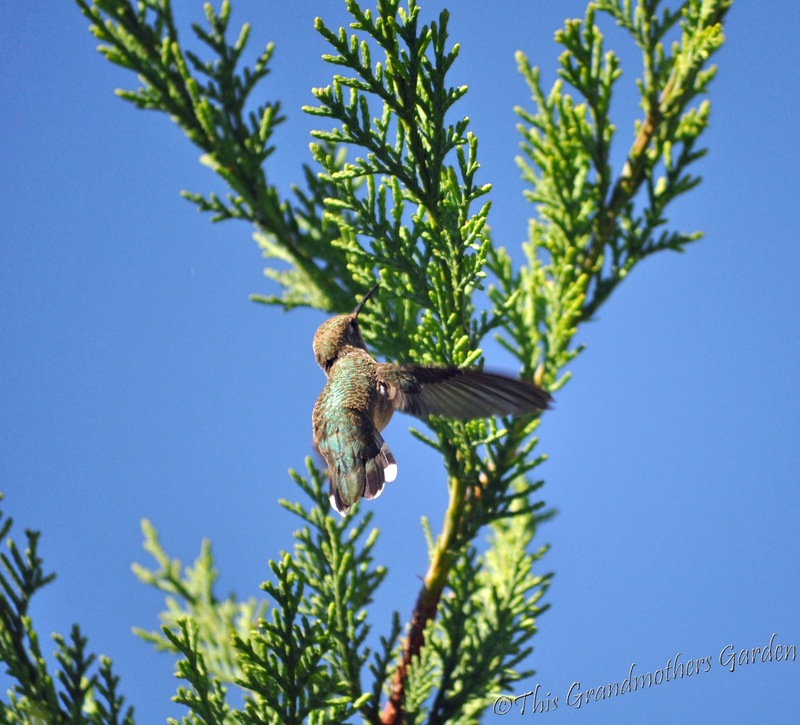 I never knew hummers were attracted to evergreens, either. Interesting. 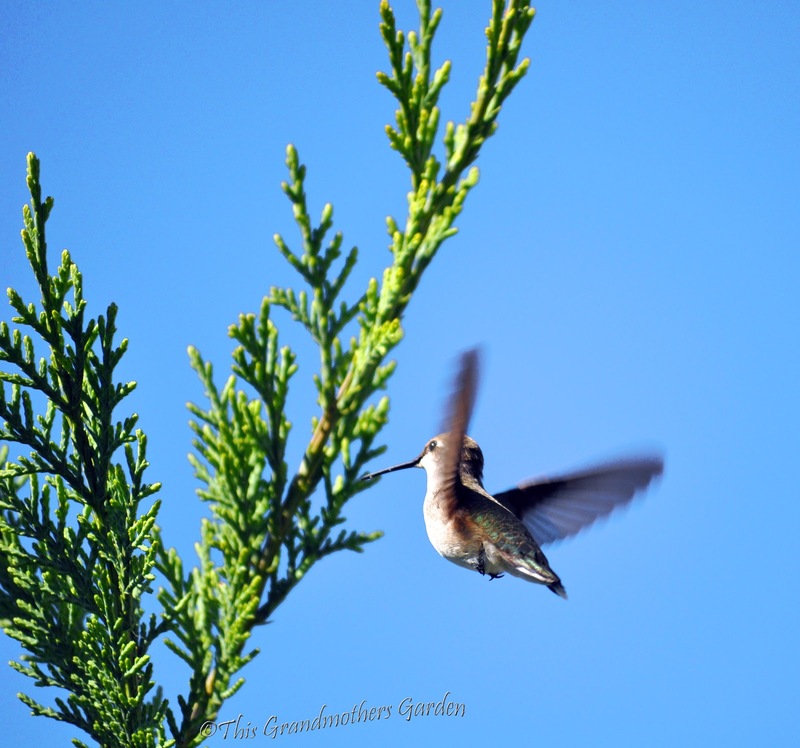 Your trees set such a elegant tone to the garden. Beautiful. What beautiful trees and beautiful pictures of the hummers! 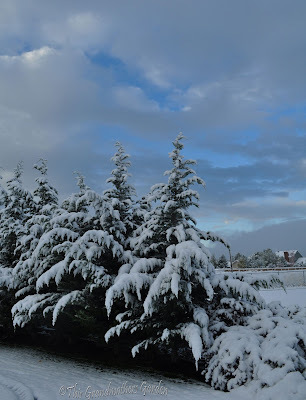 Leyland Cypress does well here but we don't often have the kind of snow that really shows them off. They look like a scene out of a fairytale! Cool fact about the hummingbirds! They are so fascinating and I'm looking forward to their return soon. 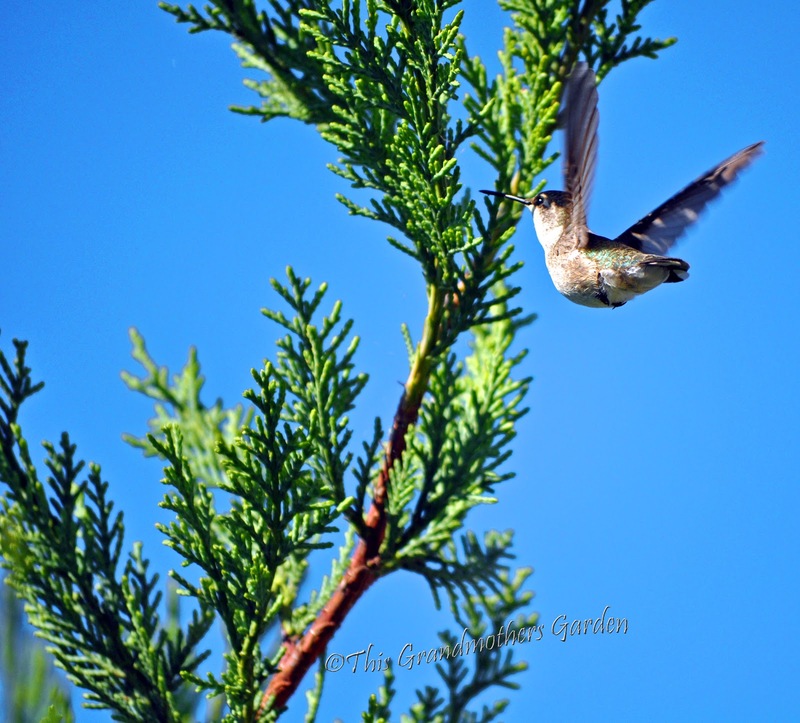 Your cypress are beautiful and it's so nice when we're blessed with such a sweet gift as a non-native thriving in our garden! Home Depot does sell everything...I always laugh at the inevitable blueberries around here. But it look like it really paid off for you. Good to know that they are hardy here. It's amazing how adaptable some trees are. 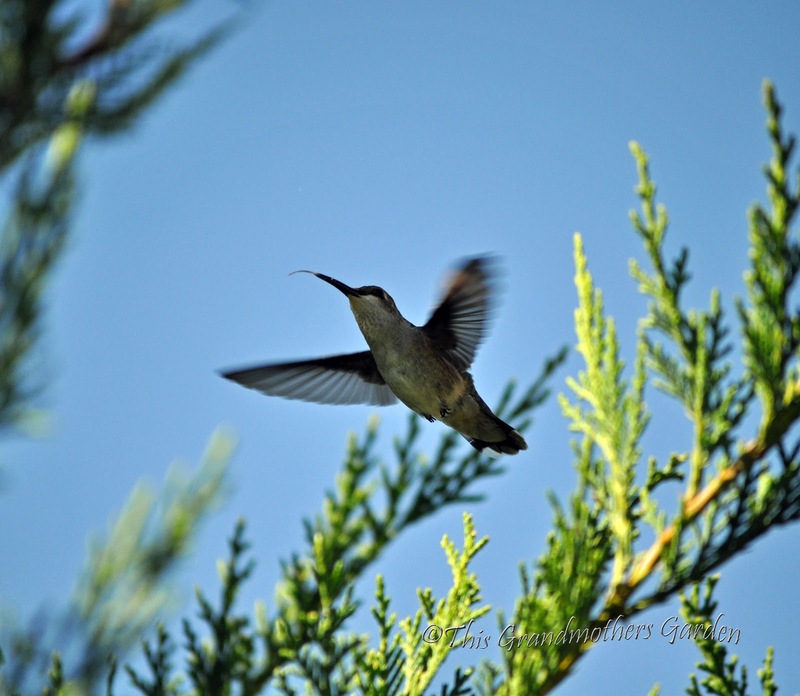 Wow what amazing photos of the hummingbirds. I'm looking forward to the next summer party already. What a wonderful combination of images in this post - the summery ones and the winter snow. Trees with those kinds of feathery textures are such a find, especially as they're hummingbird magnets to boot. Who knew?! 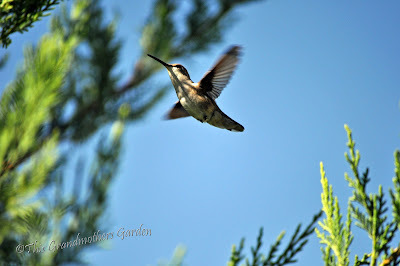 I love the hummingbirds, wonderful. I read your post with a wry smile - in the UK the Leyland Cyprus tends to be viewed as a plague on the landscape. The fast growth means that developers tend to plant it to provide fast and dense boundaries, but in our crowded Island that generally also means that neighbours have to grapple with the resultant dense shade and dry soil around the base. It was rather refreshing to be reminded that, planted appropriately, they can be beautiful, not to mention attractive to wildlife. Your sky has such a beautiful shade of blue. Thanks for sharing! The hummingbird shots are incredible! Wow! The series of photos looks like a stop-motion movie. 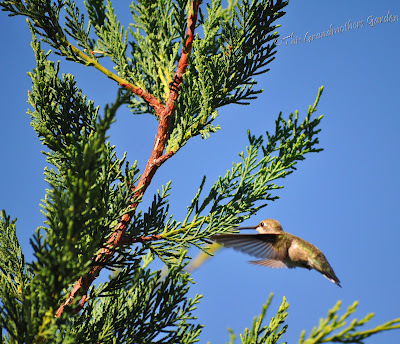 And I suppose you are reminded of the hummingbirds now every time you look at the trees. I thoroughly enjoyed this post! i adore leyland cypress trees... they make great cut foliage in a vase, too. 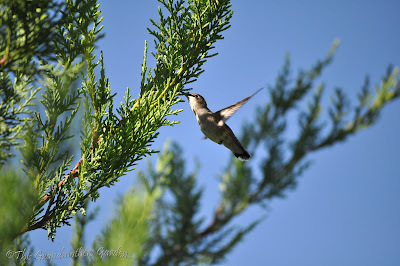 Now I'm not thinking that cypress trees provide nectar, so is the bugs the hummers are after? How interesting! I remember these amazing photos Carolyn! They are utter joy! It looks like a courtship dance. I would say they are equally in love as you are with your Cypress.